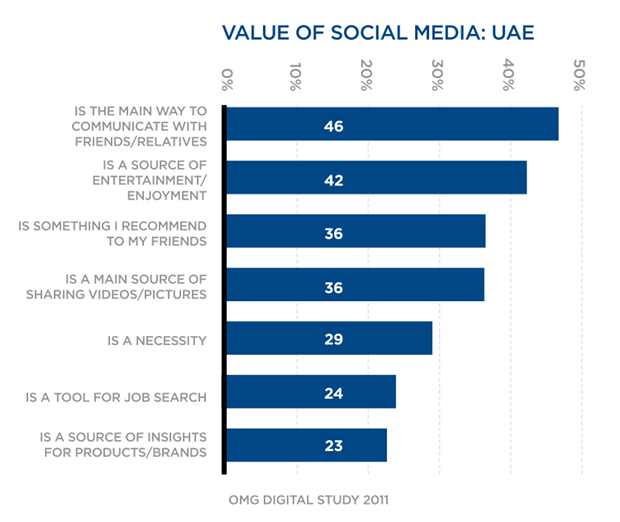 A white paper conducted by Omnicom Media Group (OMG) showcases social media habits of users in Saudi Arabia and the UAE. The whitepaper has some very interesting insights as to the differences in how users from the different countries use and view social networks. The results were collected after conducting face to face interviews with 600 online users per country all from different nationalities and aged between 15 – 60. To view more, download OMG’s white paper about social media in the MENA. 44% of users in the UAE access social networks during work hours. Peak times users access social networks is between 6:00 pm – 8:00 pm. Saudis prefer mobile, while UAE users prefer web based activities for communication with friends and family. 30 of the 70 million internet users are on social networks in the MENA. 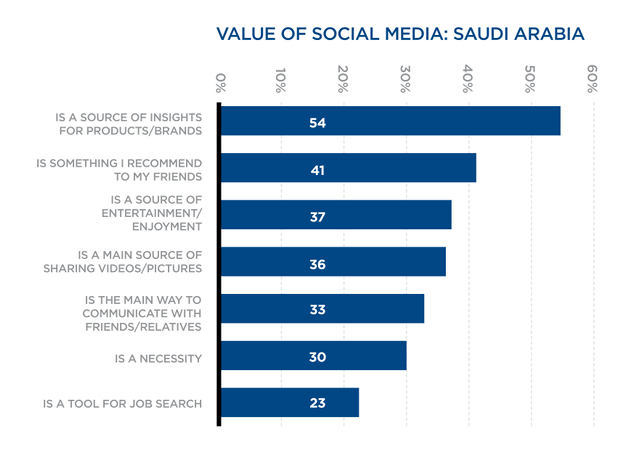 Saudis placed social networks as a source of information for products and brand first, while it was last with UAE users. Who preferred to use social networks a communication platform with their friends and family first. 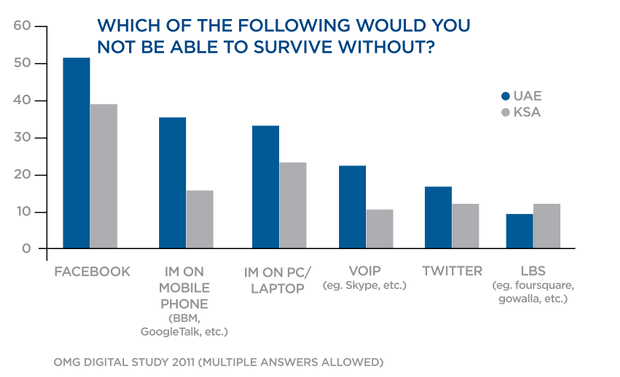 Around 30% of users from both countries placed social networks as a necessity. Social media is in the top five mobile phone uses in both countries. 70% of users have a social media application on their phones, mostly the Facebook app (46% from the 70%). 50% use their social media app at least once a day in the UAE, while only 34% use it at least once a day in the KSA. 81% use their mobiles for calls more than once a day in the KSA, while only 67% do the same in the UAE. The like/Follow has more affinity in the UAE. UAE Likers/followers would like to contribute and share more to a brand than in the KSA. 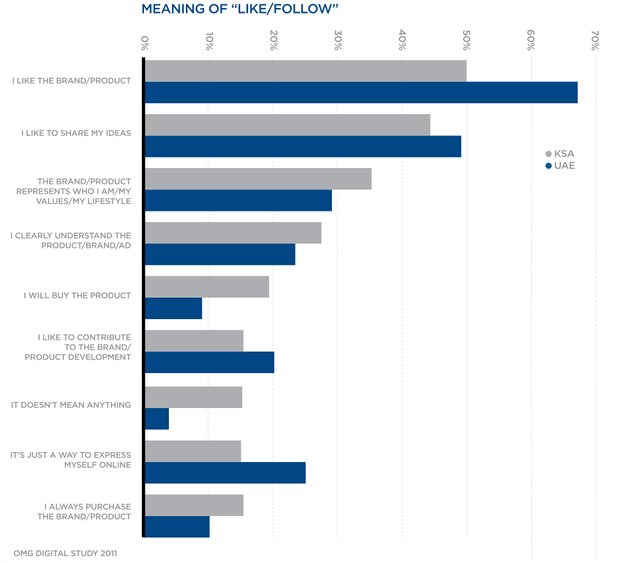 KSA likers/followers are more likely to purchase a product than in the UAE. 50% of UAE users believe that advertising is annoying and will be ignored more than in KSA where only 11% believe it is annoying. Advertise on social networks in KSA!! 90% find advertising informative, entertaining and entice them to recommend the brand to a friend. 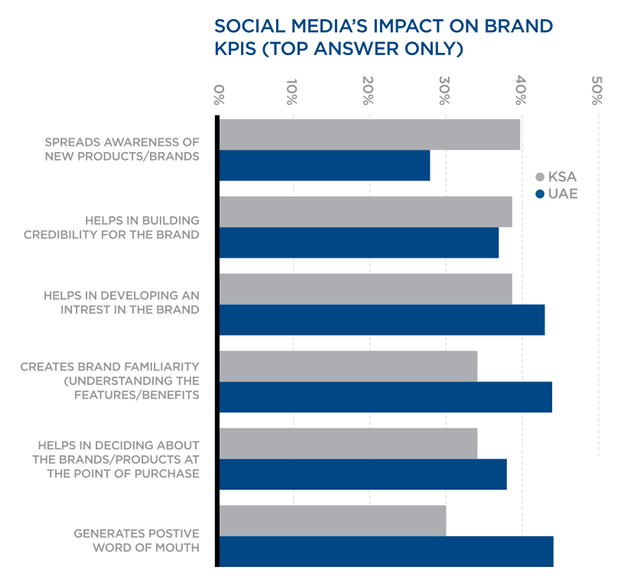 From the graph above I think it would be safe to say that for introducing new brands and products KSA would get better results. While the UAE would be better in sustaining communication with customers on social media. Perfect graph to illustrate quality over quantity of posts on social networks. 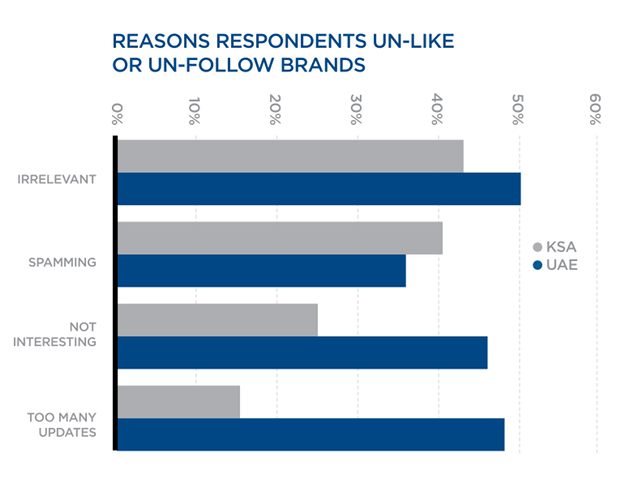 Social media users in the UAE seem to have a bigger barrier to accept brands, and are less likely to accept advertising from them on these networks. Engage don’t sell: Be relevant, and interesting.